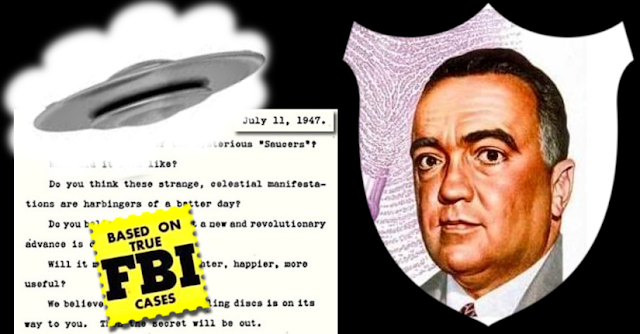 In our introduction, After the UFO Crash of 1969, we looked at how the closing of Project Blue Book seemed to cause a decrease in the public's interest in UFOs for several years, but in 1973 the topic made a big comeback and by the next year, UFOs were big business again. Who was Lawrence Brill, and how did he come to put on the show that made it all possible? 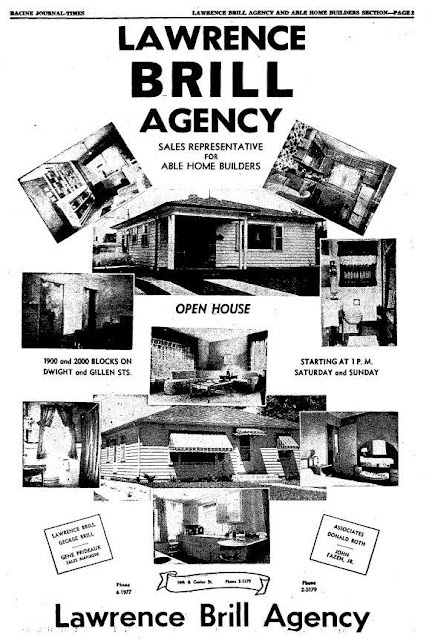 The Morris J. Brill Agency ad from 1945. Ready with financing help and sincere salesmen. 20 Years Ago. 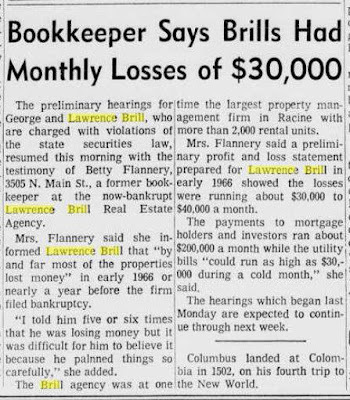 December 3, 1947: A public hearing to determine whether Lawrence Brill should be granted a real estate brokers license was scheduled to be held in Racine by the Wisconsin Real Estate Brokers License Board. Brill formerly held a salesman‘s license and was employed by his father, Morris J. Brill. Licenses to the elder Brill and two of his salesman, George Brill and Herman Kaplan, were revoked Nov. 4 when the board found them guilty of “misrepresentation, untrustworthiness and improper dealing in real estate transactions.” The hearing was scheduled to determine Lawrence Brill’s trustworthiness to operate as a broker. 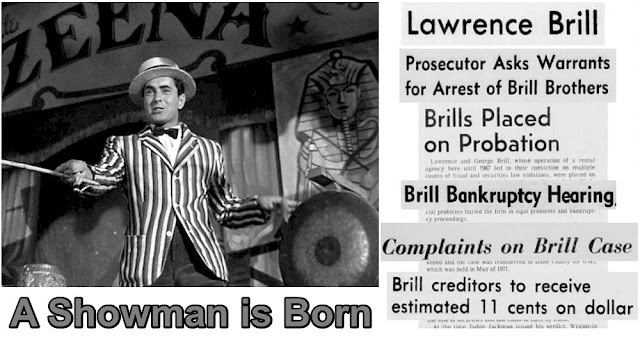 “The board had a duty to treat Lawrence Brill as an individual and not penalize him for any misdeeds of his father, brother or brother-in-law. If the board was unable to connect Lawrence with any of the questionable cases investigated, then it had no alternative but to grant the license. But in granting the license the board warned that Lawrence must not be associated with any of the other three members of the former agency and any real estate transactions. This imposes a responsibility on Lawrence to make sure that he lives to up to the letter of the board regulations. The board and the people of Racine have a right to demand this, and doubtless will maintain a keen interest in seeing that it’s done. Link to larger images of this and other Lawrence Brill articles. 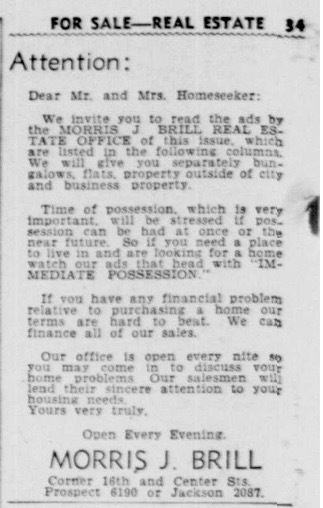 In 1948, Lawrence took over the family business, renaming the real estate enterprise the “Lawrence Brill Agency.” What did not change was the family method of operation, and eventually the “misdeeds” came to a head. In 1954 Lawrence and his brother George Brill were among those arrested for a real estate scheme. The storm passed and they got back to business as usual, but it was a strong clue of what lay ahead. Lawrence managed to avoid getting his photo in the paper, and this picture of George is the closest we found to a picture of him anywhere. The cards came tumbling down in 1967, with the legal proceedings following for several years. The two clippings that follow show how fraud and financial irregularities brought the Brill Agency down. One of the biggest upheavals on Racine's commercial scene in many a year came with the collapse of the Lawrence Brill Agency's rental housing empire. Once the largest manager of rental housing in the city, controlling as many as 2,000 units, the Brill Agency folded in 1967 and went into bankruptcy, listed about $1 million in unsecured debts, $9 million in contingent debts and assets of $344,000. The bankruptcy proceedings are still in progress. 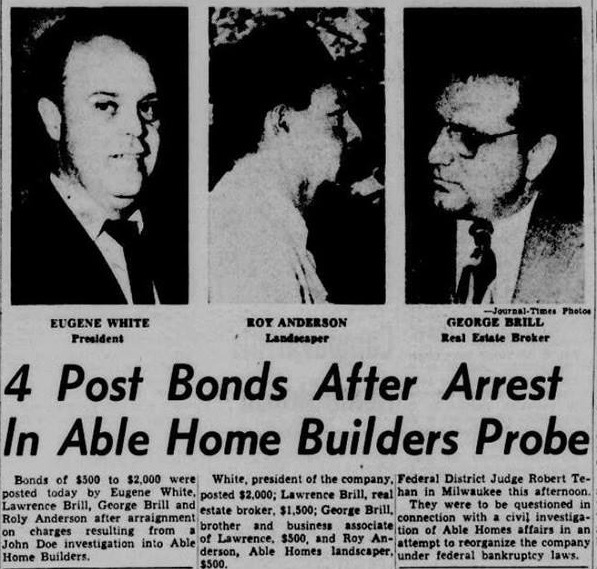 In a related action, the state this year brought a variety of charges against brothers George and Lawrence Brill, who operated the agency as a partnership. The charges allege violations of Wisconsin securities law, theft and theft by fraud. 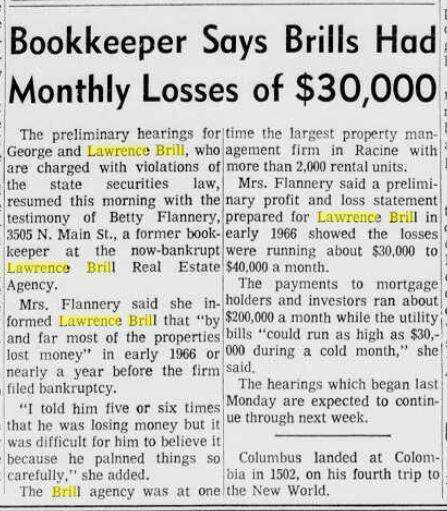 "'60s Racine's Eating, Buying Habits"
Betty Flannery, former bookkeeper for the Lawrence Brill Real Estate agency testified in 1969 that, “by and far most of the properties lost money” in the year leading up to the bankruptcy, with losses running about $30,000 to $40,000 per month. “I told him five or six times that he was losing money but it was difficult for him to believe it because he planned things so carefully." Jumping ahead in the story, ultimately the Brill brothers were found guilty, but served no time or paid no penalty, only given five years probation. In 1974, they were ordered to repay 11 cents on the dollar for their bankruptcy debts. 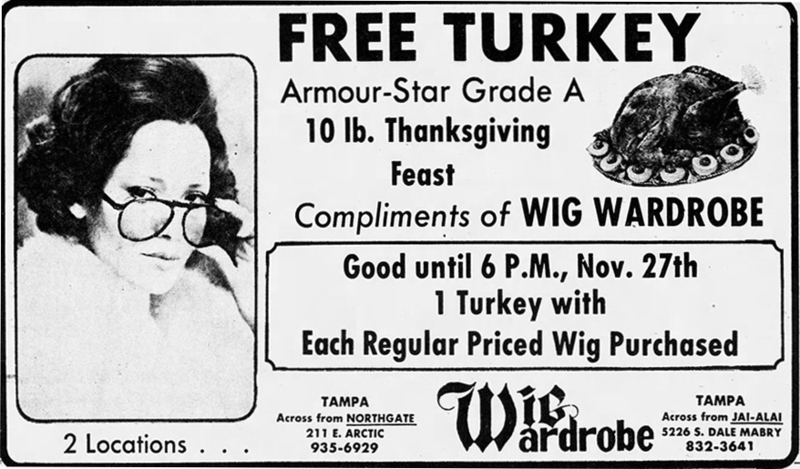 In 1967, while the legal proceedings were just beginning, George and Lawrence Brill left Rancine and moved to Florida for a fresh start in Tampa. There, Lawrence Brill became a member in local social clubs and civic organizations, and his wife Nora (nicknamed Noni), took an active role in the Tampa arts community. The connections they made in these social circles would prove to be important later, when they were introduced to psychics. 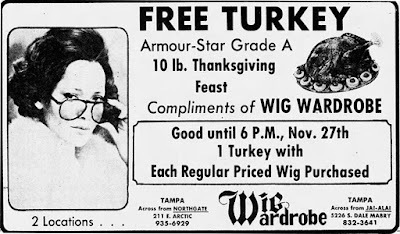 The seed for this unlikely gathering was planted nine months ago in the mind of Cynthia Stanley, who works for Palucha’s three Wig Wardrobe Stores in Tampa. While driving around town last February, Ms. Stanley suddenly decided to stop at Halarion House a now-defunct spiritual church. There, psychics Ernest and Bernadine Villanueva “read my aura,” the electrical field that surrounds the head, she recalls. Ms. Stanley says she has now become an adequate “table-tapper” — she can induce spirits of dead persons to tap answers on a table (one tap for yes, two for no). At Palucha director Lawrence Brill’s home, where the Villanuevas psychically swung a 150-pound chandelier, got PSI (Psychic, Spiritual, Intuition) Conferences off the ground. 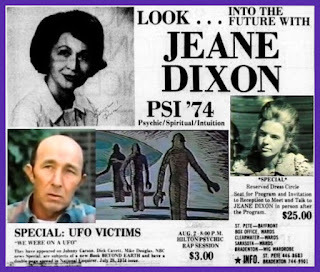 Lawrence Brill took on the role as director of PSI Conferences, and with the help of rising psychic star, Bernadene Villanueva, they were able to gather an impressive roster of celebrities for their first conference, PSI ’74. The Tampa Tribune, Aug 1, 1974, describes a social event held in honor of two of the starring psychics. the Humanities Department, St. Petersburg Junior College (who also played with the Florida Gulf Coast Symphony). 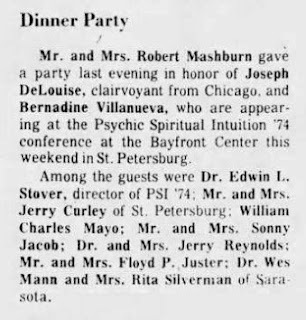 A later article lists Bob Mims, as a PSI Conferences director, another contact that Brill seems to have made through the high society clubs he and his wife belonged to. Lawrence Brill was the voice of the organization, however, and it was run through the company he owned. With the support of advertising and media coverage, Brill's PSI ’74 was ready to launch. It was held on Aug. 2, 3 and 4, 1974 in St. Petersburg, Florida, with events at the Hilton Inn and the Bayfront Center arena. Lawrence Brill's story continues in our coverage of PSI '74 and the epic UFO conference that followed it. In our next chapter: The first PSI conference, and the unpredicted response to the UFO witness.